What is a “Grommet” you ask? Have you ever been down at the beach and heard the term “grom” or “grommet” being thrown around, and have no idea what it could possibly mean? Perhaps there was a sun kissed kid running around excited about the waves that day and possibly getting ready to head out into the surf. It’s hard to say EXACTLY where the term “grom” initially originated, but has been a part of surfer slang since the early 1960’s. Grommet is frequently abbreviated to grom and refers to a young participant under the age of around 18 that participates in the sport of surfing. The first use of the word in any printed form appears in an article by Nicholas Tomalin in 1964. On a visit to Newquay in Cornwall England noted that: “A surfer who is no good or just beginning is a ‘gremmie’. The word “Gremmie”, which was used in the United States in the 1940s and 1950s, was derived from the word “Gremlin”. 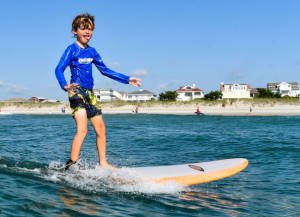 The term has recently expanded to other extreme sports such as skateboarding and snowboarding, but has been typically reserved for a particularly skilled or precocious young surfer. So, next time you come in contact with the term grommet you will have a better understanding, and who knows, you may even add it to your own vocabulary someday! Do you have your own Grom at home itching to get in the water and “shred the gnar” (grom slang for ‘surfing’)? Sign them up for our GROM OCEAN ACADEMY. “Grom Camp” is designed for kids ages 8 – 11 who are interested in the ocean and all its inhabitants. Travel around Wilmington following the coast from Fort Fisher to Surf City, soaking up the waves and habitats along the way. This program is ideal for the budding surfer or marine biologist. They will log time in the water either surfing or working on advanced boogie boarding skills. GROMS RULE!! !